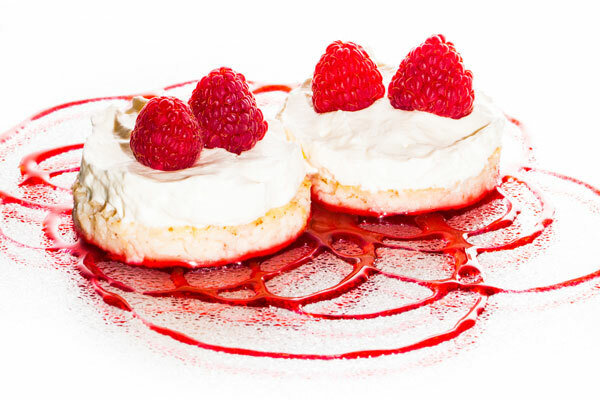 The “Swedish ostkaka” is different from the American cheesecake recipes. The original recipe calls for rennet but you can get a similar texture from cottage cheese! Line a deep baking tray with a kitchen towel. Boil a couple litres of water. Mix all the Components for the cheese cake in a bowl. Grease a rectangular baking pan with softened butter. Pour the batter into the baking pan and place on the tray. Put the tray in the oven and carefully pour in the hot water up to 1/2 of the baking tray height to make a water bath. Bake for 1 hour minutes. Put the mixture in a food processor or blender and process until smooth and push through a fine mesh sieve. Boil the sauce again until it reaches 110° C (230 degrees Fahrenheit). If you want almond slices, toast them in a medium/hot pan until they are golden brown. Pipe raspberry coulis on the plates in a pattern. Use a ring mold to cut out round pieces of the cheese cake. Pipe a layer of cream onto each cheese cake while they are still in the ring mold. Transfer to a plate and then remove the ring mold. Put a raspberry on top.